And how many switched off at the ten-minute mark in the fourth quarter? ESPN reports that Saturday’s game was the second most-watched noon broadcast in two decades. That kid’s gonna have orange-tinged nightmares for a week. I know I’m supposed to be upset by the meme of the week, but to be honest with you, things could be a lot more awful than that. And were, if you’ll recall. On the other hand, if we see Chris Relf’s name in that space next week, it’ll be time to start freaking out. It’s always sad when a good conspiracy theory dies. The judge from the Ronnie Cottrell vs. The World defamation suit says that Arkansas, not Tennessee, turned Alabama in on the Albert Means recruiting violation. I think I’ve seen this movie before. I saw the stats from the Texas-Texas Tech game, but was waiting for somebody to put them in a historical context. … the Red Raiders were held to fewer total yards (144), fewer passing yards (158) and fewer yards per play (2.7) in Saturday night’s 24-14 home loss to Texas than in any single game of Leach’s entire tenure, against anyone, home or away. In addition the new lows, the Raiders’ output on the ground Saturday (minus-14 yards) was only three yards off the worst rushing effort under Leach, minus-17 yards vs. Texas in 2004, and their 11 first downs were the fewest since back-to-back losses to Oklahoma in 2001 (9 first downs) and 2002 (10). They mounted one sustained scoring drive – the first touchdown came via an interception return by the defense – compared to seven offensive possessions that went three-and-out and three more that ended in turnovers. In almost every respect, with eight returning starters and a fifth-year senior quarterback in a familiar, friendly environment, it was Tech’s worst offensive performance in over a decade. Tony Franklin would be proud. Nobody should be surprised. With all due respect, if that’s truly the case, maybe that’s the problem. Paul makes a good case that Georgia enjoys a sizeable advantage in talent over this week’s opponent, only to risk squandering it by not deploying it fully. That’s my biggest concern about Saturday night. I’ve watched all three of Mississippi State’s games this season. The MSU defense isn’t the most talented bunch in the conference (which is not to say they’re talentless), but it’s feisty and aggressive. If MSU’s coaches go into this game taking the lessons we’ve all drawn from the past two weeks to heart, they’re going to jam the middle, take away the tight ends and take their chances with the deep ball. If Bobo plays three-quarters of the game from the I and Wildcat, forcing the run into the teeth of the defense, running every pass play out of play action, he’ll be playing right into their hands. And we’ll get exactly the kind of game we fear – an ugly, low scoring affair that risks seeing an inferior team steal a win. Richt disputed accounts that said Georgia sent all of its receivers on deep routes on the late-game 3rd-and-4 play that resulted in a Murray sack and forced Georgia to punt to Arkansas, which scored the game-winning TD three plays later. Even if that were the case (and I’m sure going to go back and watch a replay), notice that he fails to mention the real flaw in the play design: expecting Washaun Ealey to block a charging defensive end long enough to allow Murray to read the coverage and get a pass downfield. Ealey stalls Bequette for a second. It’s sufficient time to allow Murray to get a short throw off, except that’s not how the play was designed. He’s clearly looking for something to develop downfield and gets caught taking too much time. Now maybe that’s on Murray, maybe not. Watching the replay, it sure doesn’t look like a play designed to get the four yards needed for the first down. And the thing is, given how the rest of the day went with regard to pass protection from the line and Ealey, why wouldn’t Bobo call something designed for a quick hit and modest gain? There’s no question in my mind that Georgia has the talent to go on a run starting in Starkville and carry some decent momentum into Jacksonville against a Florida team that hasn’t exactly looked like a world beater so far. But there’s also no question that a coaching staff which seems uncertain about how to deploy that talent to the best of their ability – that whole rein-Murray-in approach for the South Carolina game looks counterproductive now, doesn’t it? – runs the risk of allowing a season that’s not yet beyond redemption to go off the rails with another loss or two before they ever get to the Cocktail Party. 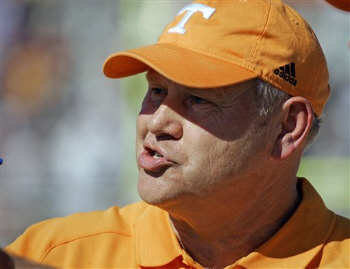 I really don’t get Phil Fulmer’s crusade against Junior – not that he’s engaged in it, of course, since it’s clearly meant to obscure his own contribution to Tennessee’s current fall from grace, but that he actually expects people to buy into it. Judging from comments like this, he’s got more work to do. Tennessee is a very proud program as we all know with great traditions and the people of Tennessee felt betrayed to be honest with you. They were embarrassed, felt jilted with all the cost of the change there was. Kiffin, he left Tennessee with basically his hat in his hand and a bunch of NCAA compliance questions.